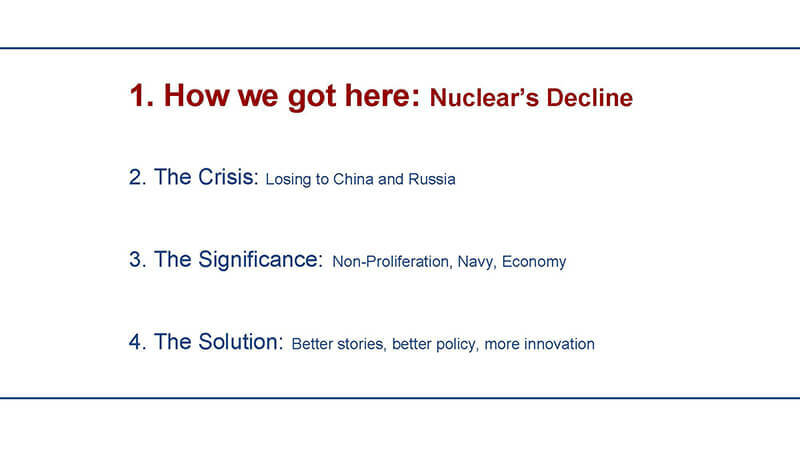 Jay’s presentation at the Advanced Nuclear Summit hosted by Third Way on the need for the U.S. nuclear industry and advocates to band together to craft a better, louder and clearer story explaining why the right policies are needed now to unlock the innovation that will save an industry in a crisis. The nuclear energy industry is complicated and interconnected. Similar to this snake, all the pieces must survive. Together the whole can truly live and thrive. 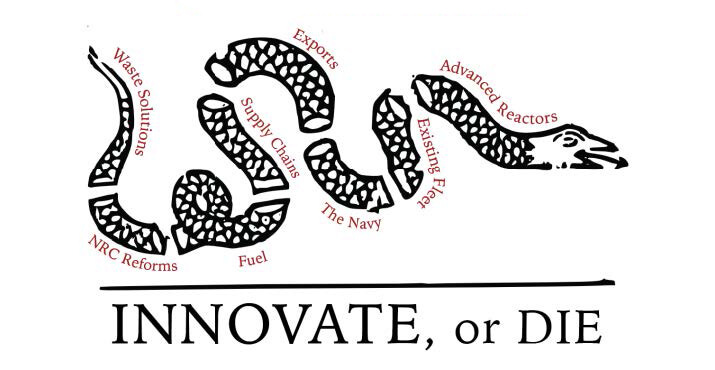 The U.S. nuclear sector is at a crisis point, where the industry must innovate or die. 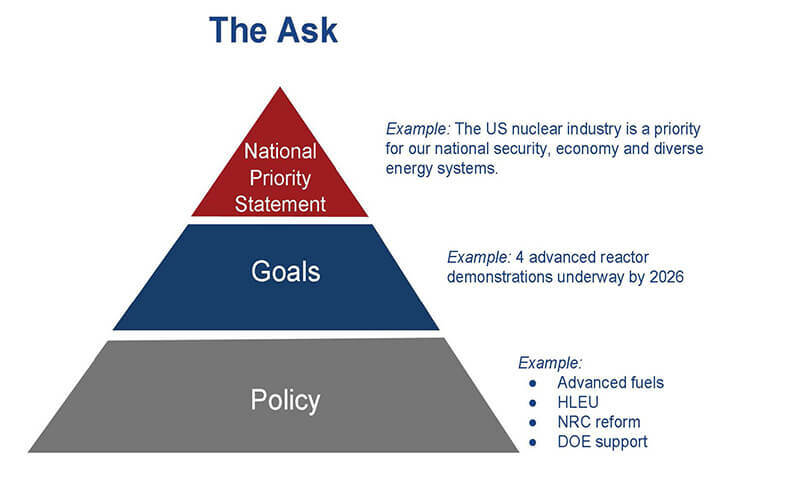 As a regulated industry, nuclear innovation depends on policy. 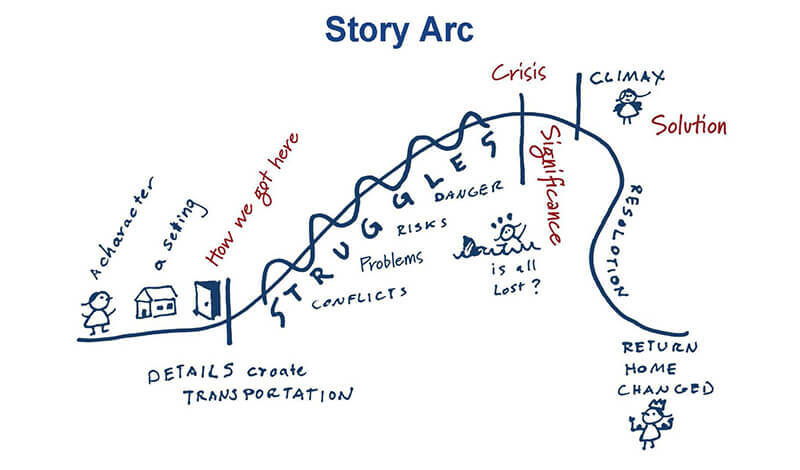 And to get the right policy, we need to better tell our story and do so loudly and clearly. 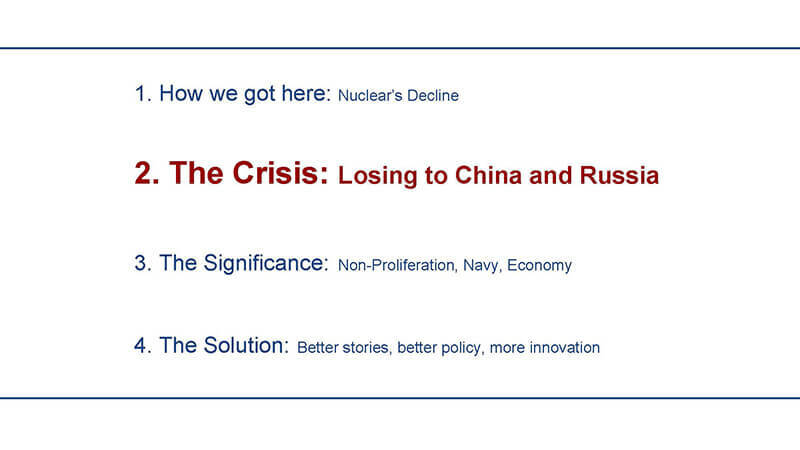 This is a take of that story — of nuclear energy at a crossroads. 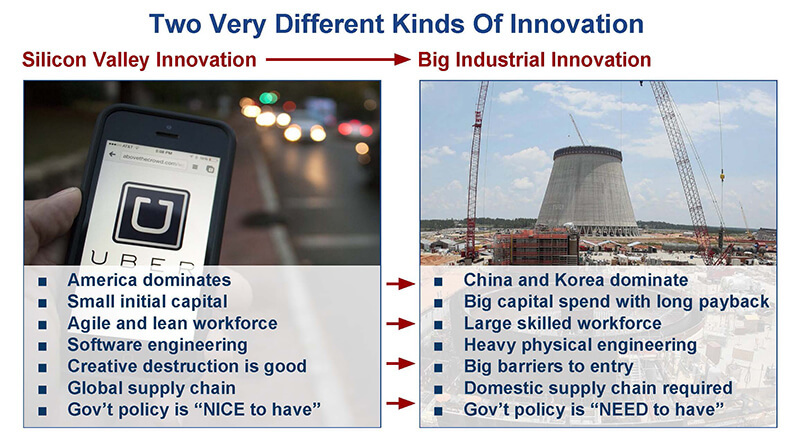 Energy innovation is industrial innovation, which doesn’t come from two guys in a garage. 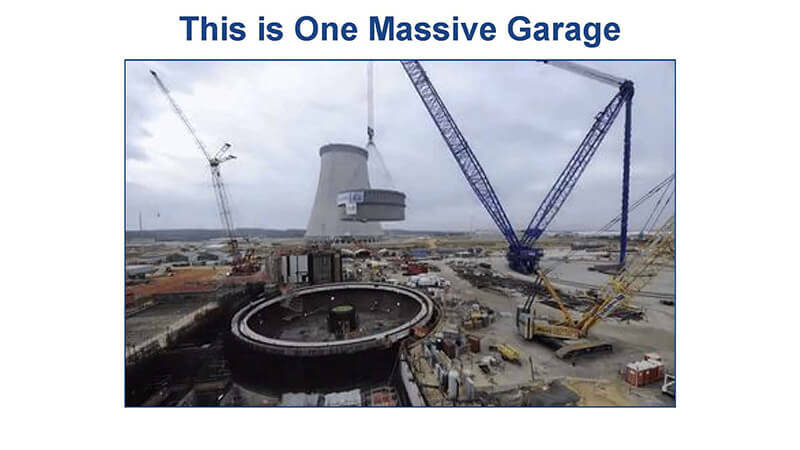 This $100 million crane is at Vogtle, where they’re building two AP1000 nuclear plants. Building a big technology for the first time, the first of a kind, is a bear. It takes 10 years or longer to build out a strong supply chain, and only a couple of years of doing nothing to lose it. You are only as good as your supply chain. And our nuclear supply chain has largely collapsed. America went from inventing nuclear energy and building 90 plants at one time — to a 20-year hiatus. The accident at Three Mile Island (where no one was hurt), staunch environmental opposition and Chernobyl stopped our nuclear boom in its tracks. 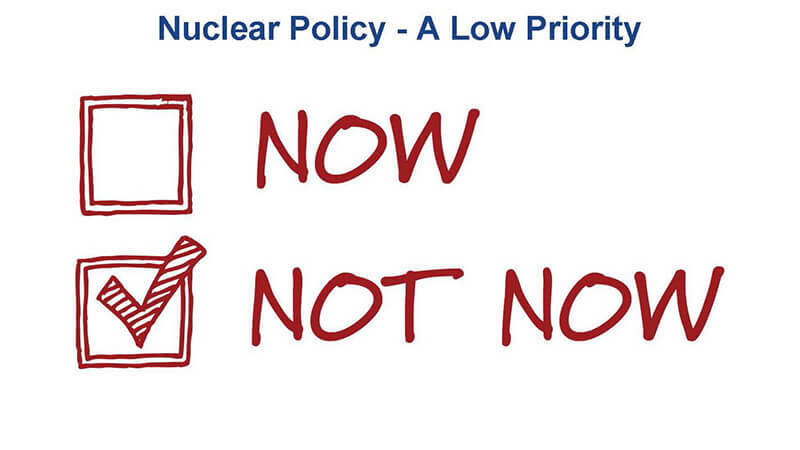 In the past decade, we’ve had difficulty starting up our nuclear supply chain after 20 years of dormancy. And now, 50% of our existing nuclear fleet is at risk of premature closure over the next 15 years. 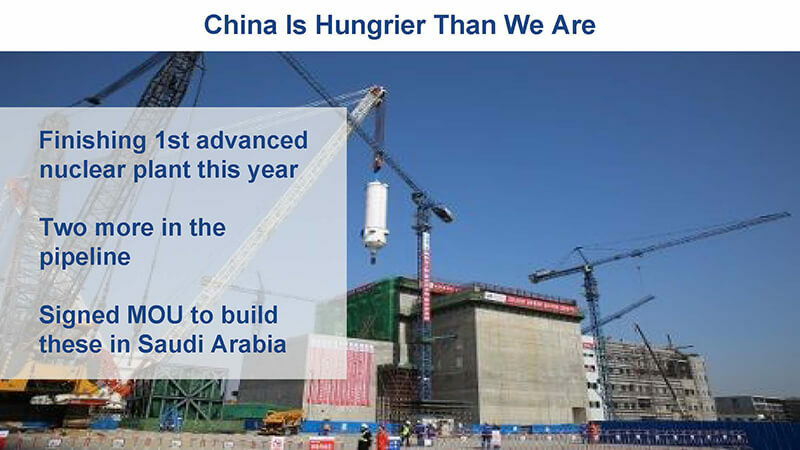 During our 20-year hiatus, China ramped up its nuclear fleet and is constructing 22 reactors and planning for up to 136. 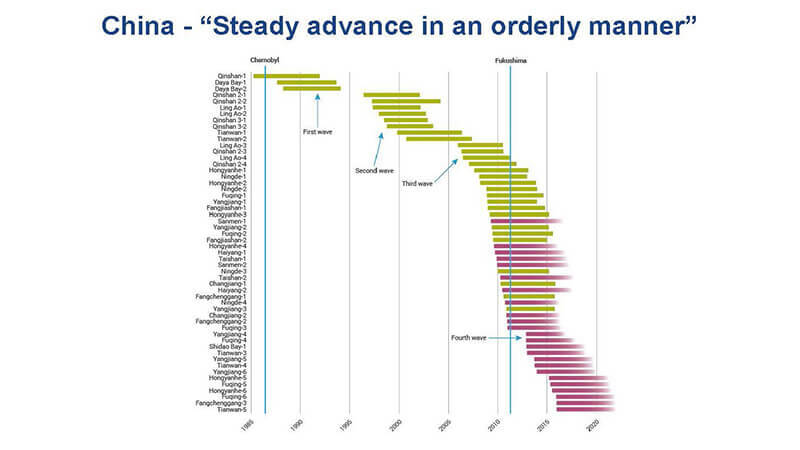 This chart shows what is required to grow a nuclear industry – consistency. Russia and Korea, the two other big players, also roughly have a reactor planned every year. 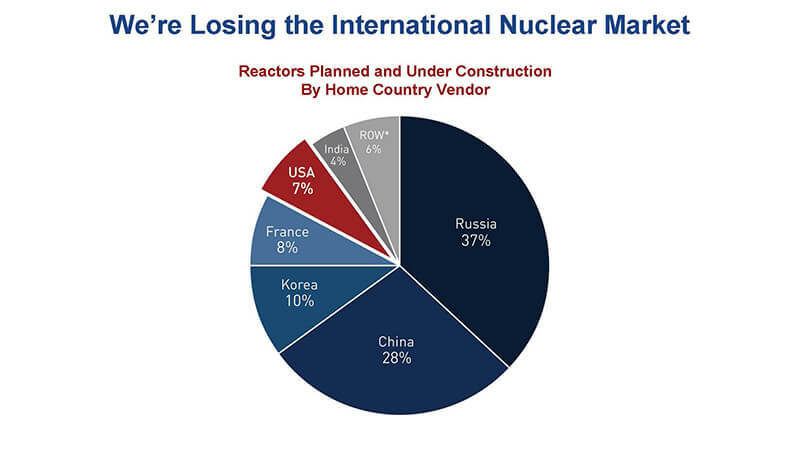 Can it be any surprise then that China and Russia own two-thirds of the international nuclear market? 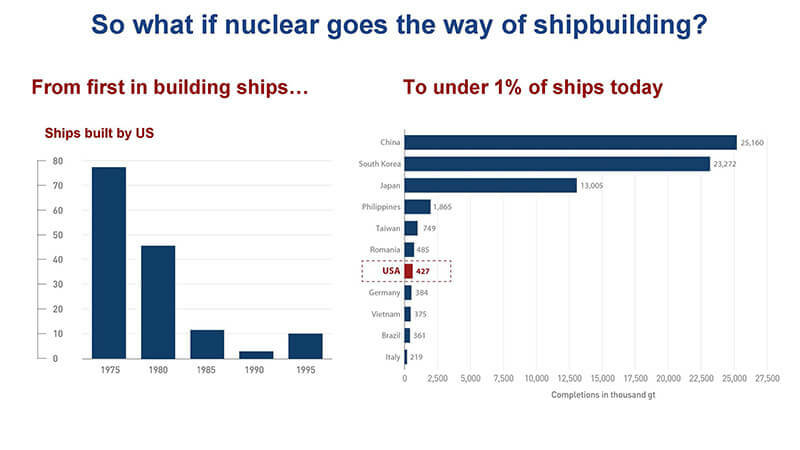 What happens if America lets nuclear energy slip away, like we did with our shipbuilding industry in the 1980s? What’s the big deal? Nuclear proliferation is a big deal. We will lose our say if we aren’t part of the international supply chain. If we’re not needed at all, we won’t have a seat at the table. 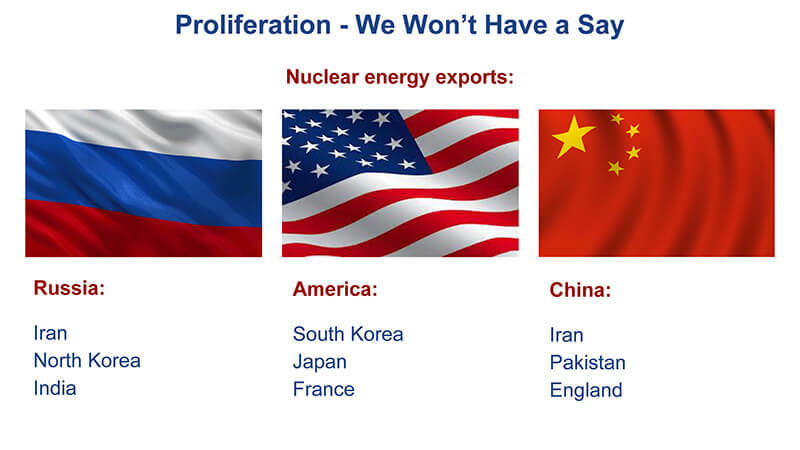 The U.S. puts more restrictions on supplying nuclear than other countries and has had a strong track record of creating good-actor nuclear states. China and Russia are building in countries like Iran and Pakistan, and many countries may come online as nuclear energy states soon. 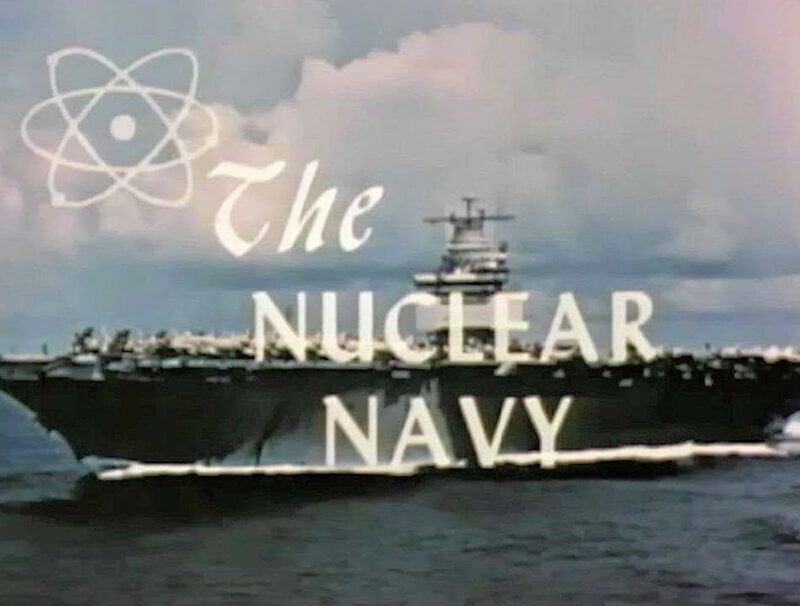 If we lose our nuclear industry, it will hurt our nuclear Navy. They rely on the workforce and supply chain maintained by our civilian nuclear power plants. With half of our 99 nuclear reactors at risk of shutting down early, jobs and revenue could go with it. 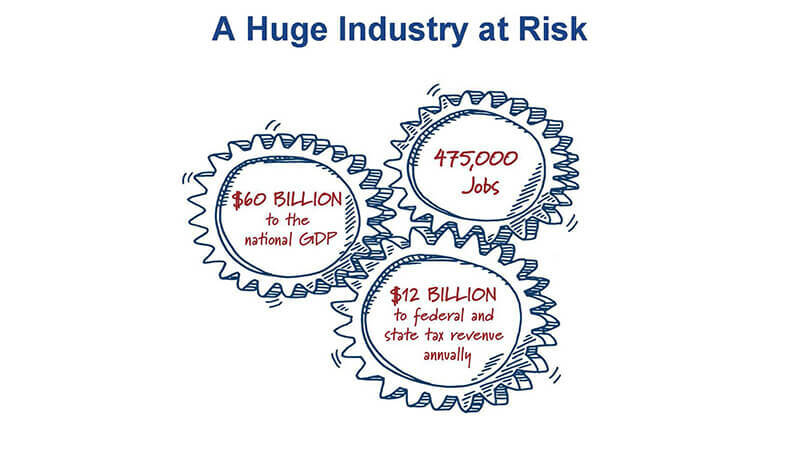 The nuclear industry sustains 475,000 direct and indirect jobs in America. No growth in nuclear means we don’t replace our old plants, and sooner or later we have no industry. 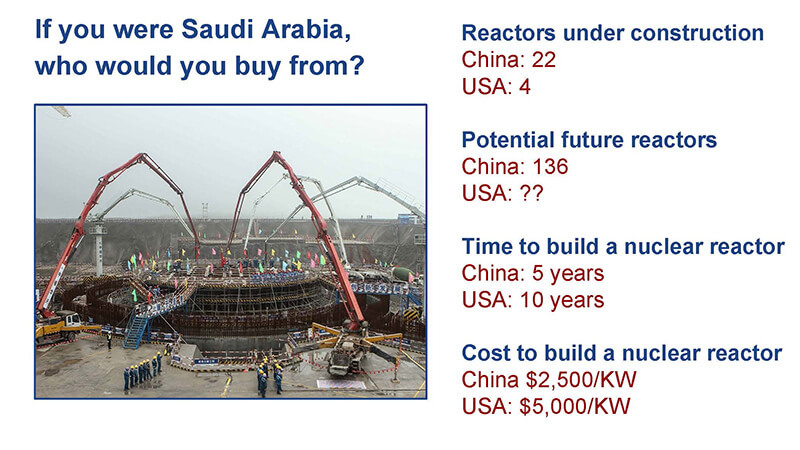 Nuclear will be a massive global market, how big we don’t know for sure. But right now, we’re missing this opportunity. 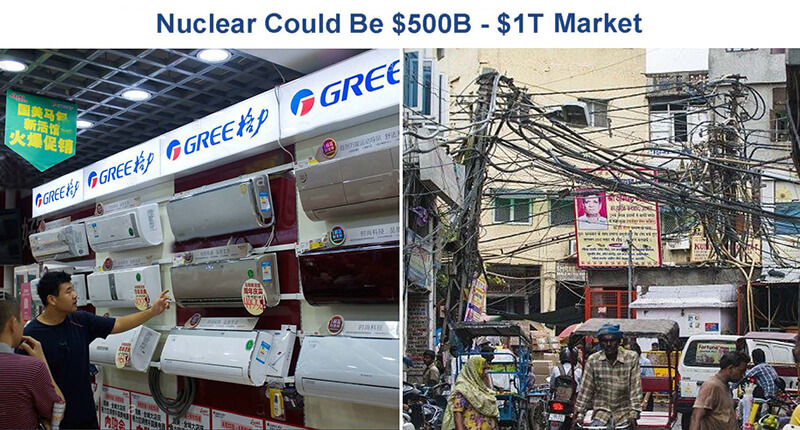 How many air conditioners will the Chinese want? In 2015, it bought 150 million of them. How many will the new Indian middle class buy? Both countries are racing towards affordable clean energy as fast as they can. America can’t win on concrete and cheap labor. But we can win on innovation. We can win on advance nuclear, if we truly get serious. We can do a SWOT analysis of advanced nuclear, on our Strengths, Weaknesses, Opportunities and Threats. Build on strength: Good at design, intellectual property, and automated manufacturing. Mitigate our weaknesses: We’re a post-industrial nation who can’t win on Big Steel or Concrete anymore. Exploit opportunity: Save our domestic industry and take market share internationally with a scalable technology. 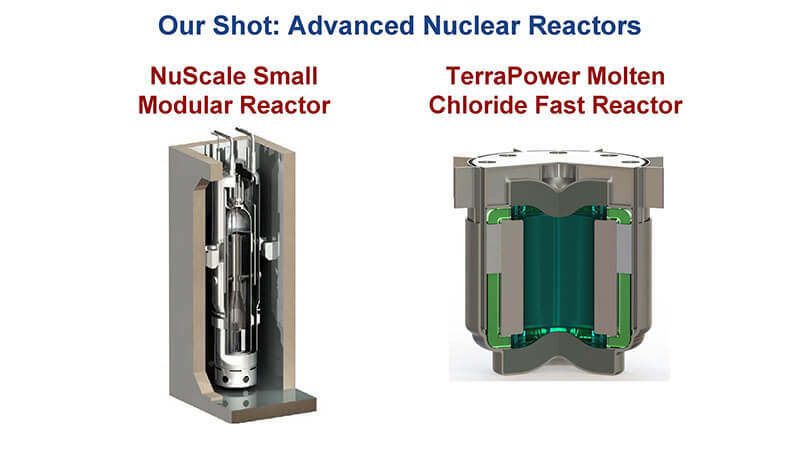 Eliminate threats: Keeps us at the table for nuclear non-proliferation, while developing technologies that produce less waste. 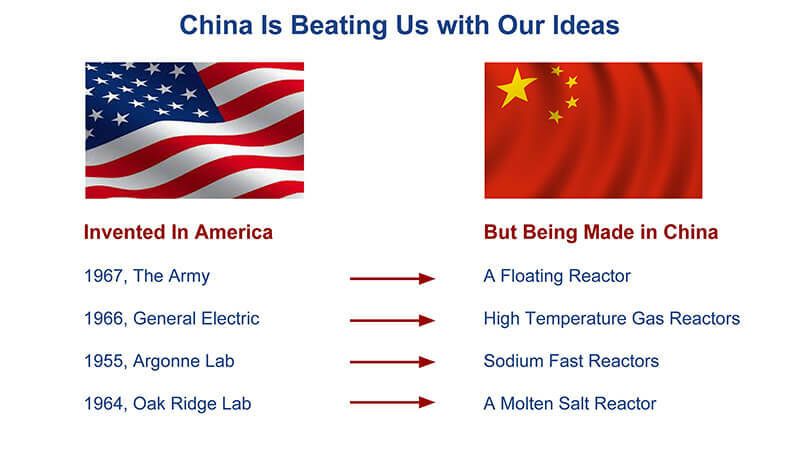 The question is, will we beat China? Even though we’ve invented the technology, they’re off to a faster start. All the advanced technologies China is in process of building were invented here decades ago. They’re beating us with our own ideas. How are we losing what we invented? 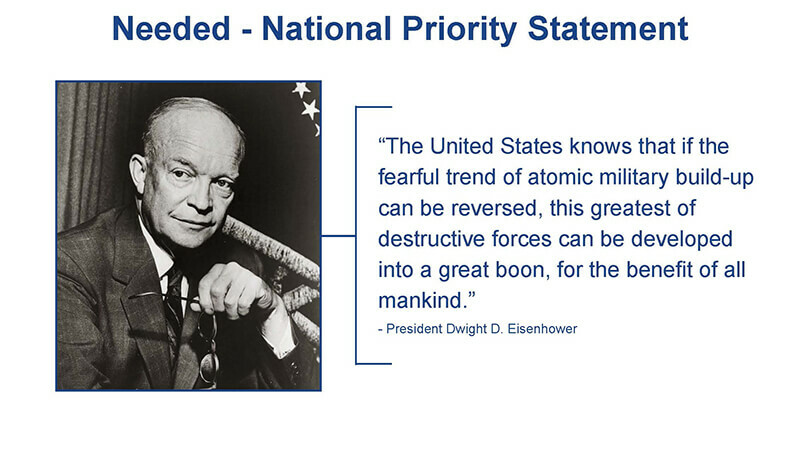 Nuclear is not a priority. In DC, they say there are two forms of time: Now and Not Now. 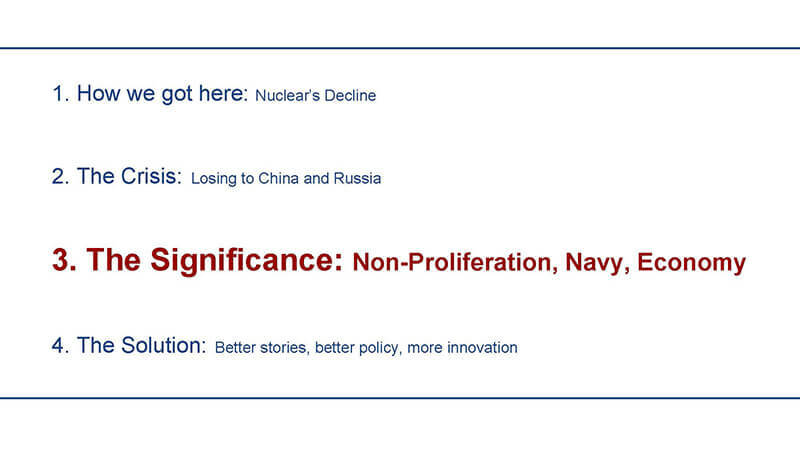 Nuclear hasn’t been seen as “now”, even though we’re actually in a crisis. So how do we make it a now? 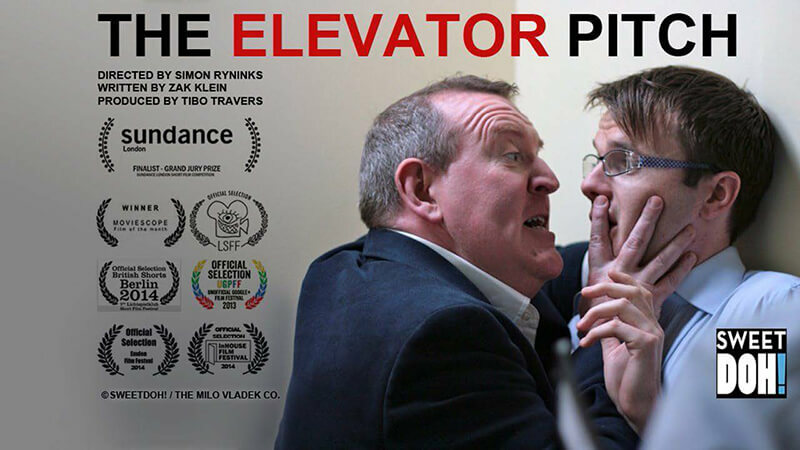 We need urgency, which means we need a better elevator pitch. 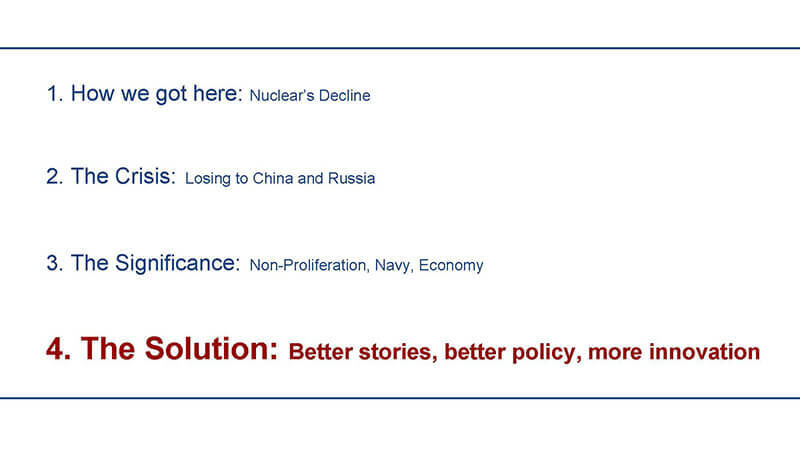 Nuclear has a great story and one that is definitely a “now” problem. The industry is the character. 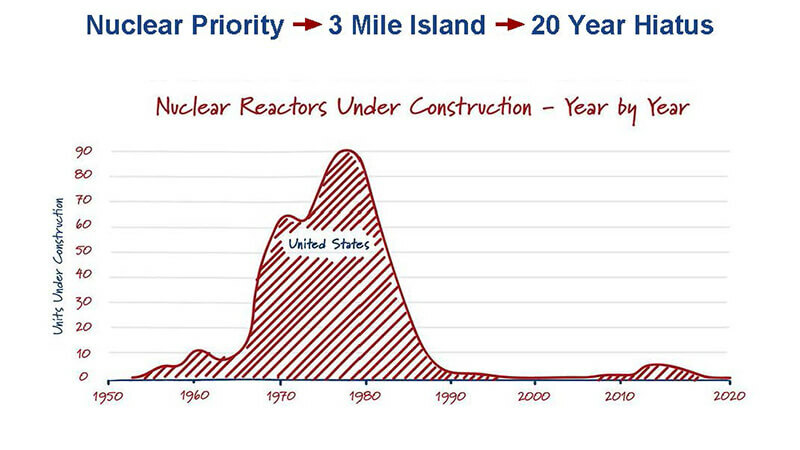 Nuclear has struggled since Three Mile Island. We’re at a crisis as we lose to China and Russia. And advanced nuclear can provide the solution. But you can’t win without smarter government policy. And we won’t get that policy unless we deliver a consistent, pocket-sized message loudly and clearly. The squeakiest wheel gets the grease. We need to squeak a lot more. What are our goals as an industry? I don’t know. We have lots of good policy, but it’s scattered. Policy should support goals. A priority statement from the top is what would provide URGENCY. We’ve done this before, building out our nuclear fleet with slide rules rather than supercomputers. We still have it in us!